$2.87 per bottle - SAVE $7.40! $2.48 per bottle - SAVE $36.20! Each Premier Protein shake contains 30 grams of protein, complete with all of the essential amino acids, 2g of sugar, 5g carbs,160 calories, 24 vitamins & minerals, and is also low in fat. We use a proprietary blend of milk protein, casein and whey protein in our shakes to help fuel muscles quickly and for several hours to help support your goals. Each shake contains 30g of protein with all the essential amino acids, 160 calories, 2g sugar, low fat, 24 vitamins and minerals, 5g carbs. Recipient of the American Master of Taste Gold Medal for SUPERIOR TASTING ready-to-drink protein beverages in a national taste test by Chefs In America in 2015, 2016 and 2019. Avalable in two deliciously smooth and creamy flavors: Chocolate and Vanilla. Enjoy them as a delicious meal replacement, a satisfying snack, or workout fuel. NO ARTIFIClAL Colors, NO SOY ingredients, GLUTEN FREE, KOSHER. Each carton contains 12 (14 fl oz) shakes. 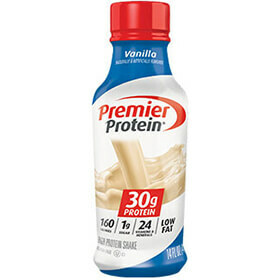 WATER, MILK PROTEIN CONCENTRATE, CALCIUM CASEINATE, COCOA POWDER (PROCESSED WITH ALKALI), CONTAINS 1% OR LESS OF THE FOLLOWING: WHEY PROTEIN CONCENTRATE, HIGH OLEIC SUNFLOWER OIL, NATURAL AND ARTIFICIAL FLAVORS, INULIN, CELLULOSE GEL AND CELLULOSE GUM, DATEM, SALT, SUCRALOSE, ACESULFAME POTASSIUM, CARRAGEENAN, VITAMIN AND MINERAL BLEND (ZINC AMINO ACID CHELATE, DL-ALPHA TOCOPHERYL ACETATE [VITAMIN E], FERRIC ORTHOPHOSPHATE, VITAMIN A PALMITATE, NIACINAMIDE, COPPER AMINO ACID CHELATE, CALCIUM D-PANTOTHENATE, CHROMIUM CHLORIDE, PHYTONADIONE [VITAMIN K], SODIUM MOLYBDATE, SODIUM SELENITE, MANGANESE SULFATE, CHOLECALCIFEROL [VITAMIN D3], BIOTIN, PYRIDOXINE HYDROCHLORIDE [VITAMIN B6], THIAMINE MONONITRATE [VITAMIN B1], POTASSIUM IODIDE, RIBOFLAVIN [VITAMIN B2], CYANOCOBALAMIN [VITAMIN B12], FOLIC ACID), MAGNESIUM PHOSPHATE, SODIUM ASCORBATE (VITAMIN C), TRIPOTASSIUM PHOSPHATE, DIPOTASSIUM PHOSPHATE, SODIUM POLYPHOSPHATE.